Tespia is Global MapleStory's "Test Server". The test server contains new content that are to be tested before its release in the Public Server. Test servers tend to contain glitches and bugs, so the job of the test server is to allow players to find and report them so it can be fixed. Nexon invites a selected number of players to Tespia. I do not know how they selected the players nor did they state how they were chosen. Nexon allowed us to copy one character from out original accounts to the Tespia. This seems much better than having to level up a new character. 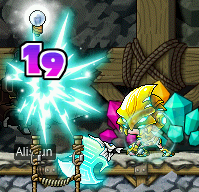 I chose to copy my Lvl 120 Evan, AIistun. The website is only viewable to players who have been chosen to play in Tespia. For those who are curious of how it looks like, I took a screenshot of it and you can view it below. Click on the picture to view the full size. One main thing that I noticed about the new monsters are their attacks. Their attacks strangely resembles the Adventurer and Cygnus Knights' attacks. I'll show and explain to you what I mean below. 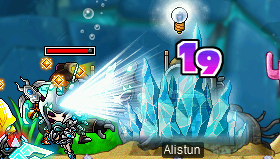 The ice attack surrounding me is from another monster using Arrow Rain. The attack next to me seems like Dual Blade's Final Cut perhaps? I took as many screenshots as I could and will continue to as I advance further into the event. So I'll try keep you guys updated as much as possible. *Click on each image to view the actual size. Ew @ the 3rd to last photo. I don't want a dirty bum roaming about Henesys. Hi Alistun how do i log in Tespia? So the resistance classes and the new maps are not out yet? you need 2 kssn's one for you and one for your parent, note that the age difference between the 2 kssn has to be at least 20 years apart and your parents name must match with the kssn or else it wouldn't work. Alistun,i'm fan of you're vidoes. you awesome! well i want to ask you something,can you make KMS Account for me? 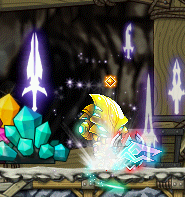 or just KMST? i really want try the Mechanic job or just play under the Big Bang .